Analyzing reports in AdWords can take up a lot of your precious time. 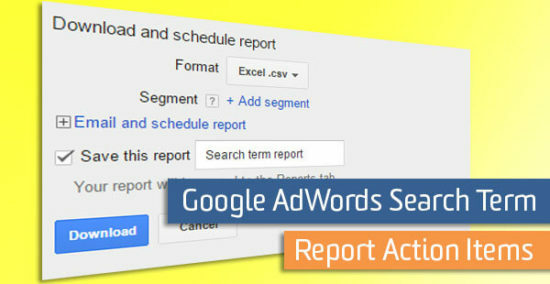 The Search Term Report can save you time and also help you optimize your AdWords accounts. This report has helped me begin to improve ad performance on many accounts. While it can give you a large amount of data, analyzing this report in an effective way can cut wasteful spending on keywords and make your ads more relevant to your target users. All these measures can increase your returns. And who doesn’t like an AdWords account that is making your company money? The Search Term Report can be found under the Keywords tab in AdWords. Within the keywords tab, you can view your keywords, negative keywords, and search terms. Click the Search Terms section under keywords to download a report of the actual search terms that a user typed into Google. Always look for the down arrow to download the report. In my experience, downloading the report as an Excel file is easiest. Once I download the report in Excel, I immediately add filters to make analyzing the report easier. Once this report is opened in Excel, it can be very large and daunting. 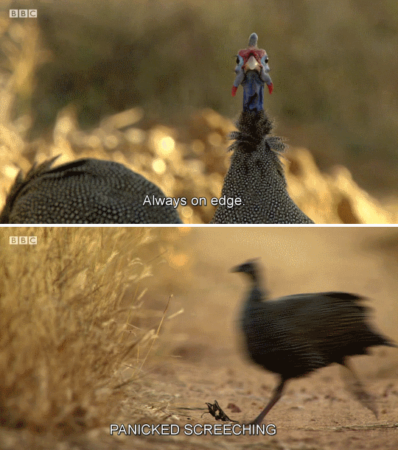 Don’t run or scream! First, begin with asking yourself why you need more search term information in the first place. Develop some questions you would like to answer using this report. These questions can come from discussions with your team, your client, or some internal questions you have had while analyzing account metrics. Purposeful use of the Search Term Report can improve your specific pain points within your campaign. Money is always scarce, so campaign cost questions could go on for my entire blog. If you are worried about cost, begin concentrating on the Avg. CPC, Cost, and Cost/Conversion columns of your report. Do not simply add all the costly search terms to your negative keyword list automatically. Think about how much these clicks are worth to you (Cost/ Conversion can help with this). In some organizations, there is a specific cost per lead or conversion that can guide your decision. Of course, it goes without saying that some industries are naturally very costly. The cost-related columns can begin to guide your bidding decisions to direct more spend to keywords that align with your specific campaign goals. Conversions are our best friends and we always would like to give more preference to our high-converting keywords. I usually sort by conversions using my Excel filters to see patterns in keywords. You may notice that certain search terms consistently drive conversions and are indicating that a user is ready to convert. Those search terms are your champions! What should you do with these champion search terms? You may want to add that term as a keyword to your ad group and simply increase the bid on that particular keyword or group of keywords. Also, sometimes it can be useful to separate that keyword and create an entire ad group targeting a specific highly-profitable keyword. Marketer Beware*: Do not compete with yourself and drive up bids! Read this blog about this danger. I sort using the CTR (click through rate) column during my analysis of the Search Term Report to see how relevant my keywords are to the particular campaign or ad group. Remember that humans are the ones clicking your ads, not random robots. When we search on Google, we are more likely to click on an ad that is relevant to our search terms. Sometimes terms with low click through ratios are not relevant to the ad or ad group. The users who viewed your ad aren’t inspired to click through to your website. Analyzing CTR can make you better at selecting keywords for particular ad group On the other hand, terms with higher click through rates can show that when that search query is typed into Google, your ad is more relevant to the user. Adding terms with high CTRs as keywords may drive more traffic and you can bid accordingly. Within your particular organization, you may refer to your products and services using certain terms. In some cases, customers do not use the same words you use when searching for your product. This disconnect may lead to a loss in traffic coming from your AdWords campaigns. The Search Term Report can be used simply as a customer behavior information gathering system. Do users still search for a legacy term or do they search a newer way or referencing your product/service? Our own LunaMetrics accounts is a great example of search term discrepancies. Some users may be searching for our trainings as “courses” or “workshops”. We have to ask ourselves if these search terms are aligning with our goals and are sending the right type of customer to our site. Additionally, look closely at terms or acronyms that you may be using in your organization. Can they mean multiple things? Are you truly capturing the right type of customer? The Search Term Report can help us identify more opportunities as well as negative keywords. Normally, I pull a Search Term Report one to two weeks after launching a new campaign or ad group. After you are confident that your keywords are optimized, you can begin pulling this report once a month to check the health of your keywords. Since we have established the importance of these reports, wouldn’t it be great if they came directly to your email? 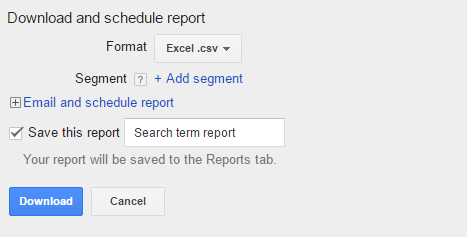 To automate the report, click on the download button while on the Search Term tab of the Keyword section. 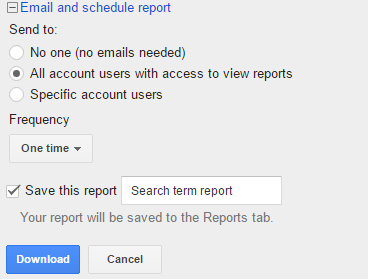 Enlarge the plus sign that says “Email and schedule report” and customize the settings for your particular tastes. How do you use the Search Term Report? Comment below with your tips and tricks.